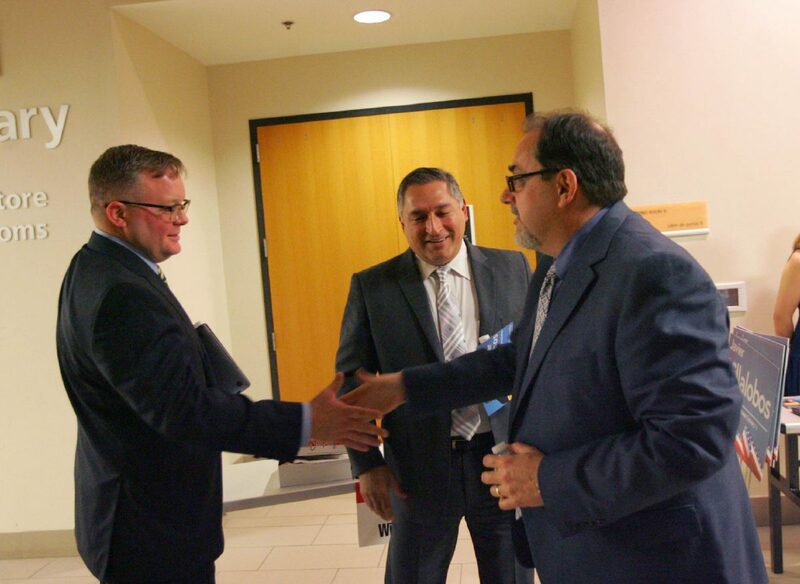 McAllen City Commission candidates for District 1 Tim Wilkins, left, Javier Villalobos, behind, and Joseph M. Caporusso talk following Futuro McAllen's debate for the candidates Thursday, Jan. 11, 2018, at the McAllen Public Library. McALLEN — Nearly a year after a city commission candidate filed a campaign finance violation complaint, the City of McAllen attempted to tweak its ordinance surrounding campaign contributions in hopes of clarifying how much money a prospective officeholder could receive from a donor and how political action committees fit into the ordinance. The proposed changes to the ordinance by the city attorney’s office brought nearly 10 minutes of detailed conversation between two attorneys on the city commission — Mayor Jim Darling and Commissioner Joaquin “J.J.” Zamora. Commissioners and the city attorney’s office wanted to clarify whether PACs were subject to a contribution limit or if PACs were bound by different restrictions that non-PAC campaign contributors constrained by. But commissioners could not figure out a solution at Monday’s city commission meeting at city hall, so they unanimously voted to table the item to the next meeting so Kevin Pagan, the city attorney, could bring back a clean recommendation to commissioners based on Monday’s discussion. >> No person, other than a spouse, son, daughter or parent of the political candidate, or political committee shall make a political contribution to a candidate for election to the Office of Mayor or City Commissioner of the City of McAllen in excess of $10,000 for office of mayor for a regular election and $5,000.00 for any runoff election and in excess of $5,000 for any commissioner office for a regular election and $2,500 for any runoff election. >> No person as a candidate for election to the office of mayor or city commissioner may accept a political contribution from any person, other than a spouse, son, daughter, or parent of the candidate, or political committee in excess of the limits specified in paragraph (a) above. >> No person or political committee may make political expenditures or pay for political advertisings relating to an election for the mayor or a city commissioner where the total costs are in excess of the limits specified in paragraph (a) above. Commissioners focused on whether the ordinance currently limits PACs to a contribution ceiling, or if they have one at all. Zamora questioned whether a donor could make multiple contributions to a candidate in various instances totaling more than $10,000, as opposed to a one-time, greater than $10,000 donation. Zamora focused on adding the word “cumulative,” which Darling noted. But Pagan said he’s never had an issue with sums that large. “Candidly, I’ve never seen or been asked about a contribution above $10,000,” Pagan said in an interview after Monday’s meeting. But Pagan acknowledged that the sentence syntax could use minor adjusting, hence the item being brought before the commission. Pagan told commissioners there have been several instances that have caused the city to consider clarifying the ordinance, but the District 1 special election early this year was the most recent spotlight on the city’s campaign contribution ordinance. Timothy Wilkins, a businessman who ran unsuccessfully for the District 1 city commission seat vacated by now-Hidalgo County Judge-elect, Richard Cortez, filed a complaint against an opponent in the race, Joseph M. Caporusso, a podiatrist who also ran unsuccessfully for the post. Caporusso received a $10,000 campaign contribution from the Border Health Political Action Committee. “In our reading, it excludes PACs from that cap the ordinance talks about,” Caporusso said in January in response to Wilkins’ allegation. The Border Health PAC, which dishes out large sums of money to political candidates across the country, said at the time that it is keenly aware of all local, state and federal regulations. The PAC added that it did not violate any McAllen laws. Commissioner Javier Villalobos, an attorney, defeated Wilkins in a runoff election in March. Villalobos, at the time, raised concerns about the PAC contribution, but he did not file a complaint with the city during the campaign. Villalobos was absent from Monday’s meeting.